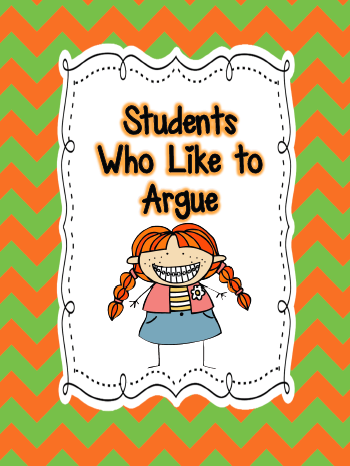 Have you ever had a student who wants to argue with you about everything? For the purpose of this post, we’ll call this student, Debatable Deb, because Deb feels like every topic is up for debate. There are times you swear this student is playing devil’s advocate because she argues for the sake of argument. The years that you have one of these students, you go home mentally drained because you are constantly being challenged. Years ago, I did my student teaching in a 3rd grade self-contained gifted classroom. The elementary school had 2,000 students which at the time was the largest in the state. There were 14 – 16 sections of each grade level and two of these sections had only gifted and talented students. These students’ lessons were taught at an accelerated pace. 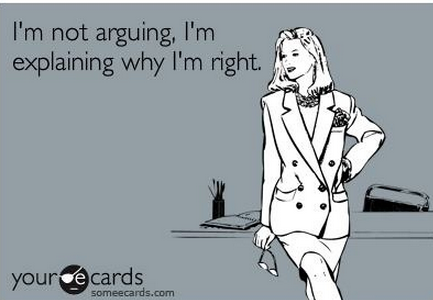 My cooperating teacher told me that in a G/T classroom, arguing and debating is very common. She shared a few tips with me that I thought I’d pass along. Tip #1: There are times when you can listen to what the student has to say if it is said in a respectful tone. But, it is also perfectly permissible for the teacher to say “this is not a matter for debate.”. You are the leader of the classroom not the student. Tip #2: If you have a student who feels very passionate about some topic or decision, encourage Debatable Deb to write about it. Have your Debatable Deb make a T-chart listing the pros and cons about the topic. This will encourage your student to become more open minded. As a person who was born with a argumentative personality, I can tell you that it is very frustrating when you feel like you don’t have an outlet or someone isn’t listening to your opinions. Have you ever had a principal who had the management style of “my way or the highway”? Nothing was ever discussed, decisions were handed down like edicts, and you were left feeling like you were merely a worker bee. You didn’t necessarily want to argue with your boss about every decision he made, but you wished you had some input before a decision was made that you were required to carry out. Some decisions could be improved if there was input from others. I sometimes think this must be how your Debatable Deb feels when you don’t take the time to listen to her opinions or give her an outlet like writing. Granted, not every decision is open for discussion, just like with your principal. But, there are some decisions that could involve more student input. Timing is everything! Do not ask your teacher about this when she is getting ready to teach a new lesson or at the end of the day when it’s a madhouse in the classroom. Timing is key! Your tone of voice conveys so much. Your tone should be respectful. Your sentence should not begin with the word “you”. Wrong choice: You should have accepted my Book It paper because I missed school for 2 days because my grandpa died. A better choice: I was out of town for my grandfather’s funeral. We flew home on Sunday evening. I normally pack my backpack the evening before but I was off schedule. I’m sorry. Hopefully this won’t happen again. After talking with your teacher, you need to graciously accept whatever her decision is whether you agree with it or not. Although her teacher did not accept her paper after my daughter spoke to her, my daughter wasn’t upset. Why? Her teacher took the time to listen to her and her teacher explained her decision. This pin sums up what I think these students are thinking! *Giving them a designated time to discuss the matter that is not class time such as recess or after school. *Do not engage! Do not engage! Do not engage! Is some of my followers’ mantra. Some even suggest just staring at the student, not saying a word. Eventually the student gets the point. *Having a sense of humor is another tip to try. You can read more on my FB page by looking for the picture of the pin (“I’m not arguing, I’m explaining why I’m right.”) above. These are great tips! Thank you for sharing them! The tips are great but reading them was difficult because of the polka dotted border….not reader friendly. I once saw online a tip that has you tell the child, "I love you too much to argue with you." and then just walk away. I've found it very helpful for those students that argue ANYTHING. They were talking, I told them not to and they argued that they weren't talking. I just make the statement and walk away. So much less stressful. LOVE the tips, but hate the background, makes me dizzy! Nancy, if you want to minimize the polka dot background of my blog, you can click on "command +" if you are on a MAC. This will increase the size of the text. I give my students either a spiral notebook or a drawing journal to "report" or "document" their "concerns". The students turn their journal in for their teacher to review (as soon as they are able). This takes away the immediacy and doesn't provide immediate gratification. Great source of documentation and "data collection"! I agree to not engage. I teach Gifted students and my colleagues say I'm the best at not engaging. It has taken me a long time to figure out how to do it, but I do it daily now. I had a GT student 3 years ago and he was one of the most argumentative children I had ever had. He just wanted to be heard. Sometimes I would give him a buddy to listen to him just so he could get it out. He wanted to talk FOREVER and I simply didn't have time. I also gave him a notepad that he could write on and when I was at my teacher table, I would call him over to talk about what was in his notepad. It did take a lot of extra time, but he was an only child being raised by his single mom and his grandmother – both with master's degrees. The family loved to talk & debate! I have a sign in my room that says: I only argue at 4:45 AM when one of them starts to argue with me I just point to the sign. I also use the line.. Sorry I don't argue with 5th graders. The statement asked and answered works great too.